More on Ninito and John Sumner, 1867. 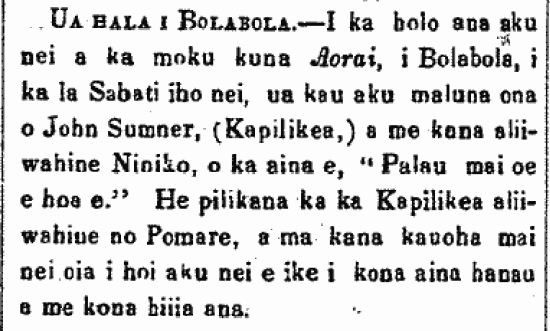 Left for Bolabola.—With the departure of the schooner Aorai to Bolabola, on last Sunday, on board was John Sumner (Kapilikea) and his queen, Niniko, from foreign lands, “Palau mai oe e hoa e [“Talk to me O Friend” in Tahitian? ].” Kapilikea’s queen is a relative of Pomare, and at her behest, Ninito is returning to see the land of her birth and to be embraced. Ke Au Okoa, Buke III, Helu 23, Aoao 2. Sepatemaba 26, 1867.